Anyone paying attention to the tiring constant 24/7 surreal ISIS psychological operation of the last six to eight months has probably noticed that with the recent bombshell revelations of ISIS working with Israel and the U.S. by the government of Iraq, the western mainstream media has finally gone into retreat on the ISIS show. All indications are that the ISIS theater finally ran into an inevitable brick wall. From ISIS supply chopper taken down in Iraq, to U.S./John McCain close buddy now leading ISIS in Libya, to U.S. and Israeli ISIS "advisors" being arrested in Iraq. The architects of this psyop never had a chance of convincing the entire public as many in the truth and liberty movement figured it out from the start. As a group, many of us around the world made a commitment to sharing truth and that commitment led to more ISIS operation lies being exposed to the general public. Do your own random survey and try to appreciate how many people at least have heard the rumor that ISIS is a staged psyop working for the new world order not against it. The public scope of this awareness should not surprise you. That's because mainstream media really is dying and losing its influence on the general public. Conversely, that is because the alternative, independent or new media really is rising. More people are turning to independent alternative media to get their news. Alternative media has been all over the ISIS show exposing the oddities and coincidences that surround the ISIS theater, many which can no longer be ignored by the average person. Who can stand any more of the ridiculous ISIS sideshow anyhow? It all came about when our U.S. government and its Middle East new world order allies all decided to overplay the ISIS psyop. CIA and Mossad Intelligence decided to move forward with the over-the-top script we've all been subject to for months, portraying ISIS as invincible warriors. ISIS from the start was portrayed as self-created masterful military fighters capable of outsmarting all global counterintelligence efforts against it with ease and precision. Only ISIS could take on multiple countries in battle, make promotional propaganda videos all over the internet, recruit new soldiers in countries all over the world, tease the U.S. and it's supposed enemies with threatening videos of their crimes, steal massive military weapons cache, overpower over 30,000 Iraqi soldiers in Mosul Iraq with just a few hundred fighters, and brag to the world how they are winning. All the while evading all forms of surveillance, spying, tracking, generating their endless top secret untraceable supply of food, water, ammo and toiletries and maintaining endless sources of super secret and untraceable funding and banking. 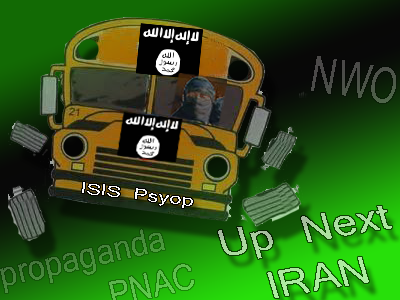 Pretty soon, to those fully awakened to the new world order plans, the ISIS psyop theater became just that, a daily theater of lies all designed to provide the backdrop for further U.S. intervention in the Middle East. All of this would turn out to be exactly outlined in General Wesley Clark's "7 countries in 5 years" PNAC invasion plans exposed years ago by the General. The bigger threat to the Islamic State’s capacity to endure, however, may come from within, as its grandiose promises collide with realities on the ground, said Lina Khatib, director of the Carnegie Middle East Center in Beirut. Most striking are the growing signs of friction between the foreigners lured by its state-building experiment and local recruits, who have grown resentful of the preferential treatment meted out to the expatriates, including higher salaries and better living conditions. Foreign fighters get to live in the cities, where coalition airstrikes are relatively rare because of the risk of civilian casualties, while Syrian fighters are required to serve in rural outposts more vulnerable to attacks, said an activist who opposes the Islamic State and lives in the town of Abu Kamal on Syria’s border with Iraq, speaking on the condition of anonymity. Careful to maintain the psyop, western media reports how ISIS' only threat comes from within not the supposed battery of nations trying to defeat it. That, apparently is still the easy part. In other words the MSN article tries to maintain the ISIS psyop claiming ISIS has not been scratched from the outside. Their surreal power and invincibility despite some minor setbacks are supposedly intact. The dilemma mainstream media faces is how to get out from under its own lies and exaggerations. They've even resorted to new secondhand stories in a desperate attempt to reinforce some of the previous fake beheadings and spoof videos they now have characters claiming to have witnessed the beheading. Logic tells us if you provide solid evidence of the event to begin with, you wouldn't need after the fact witnesses popping up much later. Isn't it strange as a whole to put out a story in a desperate attempt just to prove a previous story was really not a lie? Doesn't this sudden witness emerging attempt remind us of the "I shot Bin Laden" psyop of 2014 where a supposed Navy Seal suddenly stepped into the media limelight claiming he shot Bin Laden dead in 2011? These staged appearances of witnesses long after the event has past seem to have a pattern and it appears we've seen this script before. This is not to say the mass beheading didn't happen, just pointing out the similarity in the scripts, the usual exaggerated attempt to convince the audience with a staged witness who could easily be lying, and the usual lack of hard evidence to back up the claim. So again, with the recent ongoing breaking news coming out of Iraq of the U.S. and Israel caught once and for all with their hands in the cookie jar supporting ISIS, western media had no choice but to not only slow down on the ISIS psyop coverage but to actually manufacture the next huge pro-war propaganda meme. One that serves the exact same purpose consistent with the PNAC plans and the now famous '7 countries in 5 years' plan. Enter the Iran nuclear weapons part 2 psyop. This is what aggressive and relentless empires do when they thirst for power. They accept a setback, they regroup and go for another target. Every since the ISIS psyop took a death blow in Iraq the western mainstream media mouthpiece is now well into the new meme. The meme was set up nicely by having Israeli prime minister Benjamin Netanyahu come all the way out to the U.S. and take over our Congress as if he was part of Congress. The funny thing is that aside from the brainwashed "pro-Israel" zombies, that is the pro-Zionist crowd that naively believe the Godzilla sized lie that- Zionism = Judaism and that current day Israel is equivalent to the biblical Israel, aside from this crowd and aside from the western mainstream media believing zombies, it doesn't seem like anyone else on the planet is believing this latest round of "Iran is the new boogie monster that needs to be attacked to save Israel". The fact of the matter is that the western pro-war, Middle East takeover script is old. The world is tired of their script and humanity wants to dump it like a bad tooth ache. Netanyahu now IMO symbolizes everything that is wrong with humanity. The 'wage war in the name of defending Israel and fighting terror' meme is old and mentally tiring. Especially when we know this is the very same terrorism created and funded by Israel and the U.S.. So let us all tackle the new Iran boogie monster meme the same way we tackled the now very tiring ISIS psyop. Let's continue to laugh all of this off. Let's not take any of this theater too serious but at the same time let's stay in step with this cabal with every move they make. Let's do it for the sake of future generations. Let's do it for humanity. Let's remind ourselves why we expose these operations. We do it first because we love humanity and we don't feel humanity should be subjected to the desires of these psychopaths. I pray today that the Iran boogie monster psyop crashes into the same wall that the ISIS psyop crashed into. Let us all continue doing what we do and hopefully the western cabal will begin to implode from within with its own infighting. Hopefully some of the old evil men like Cheney and Kissinger will finally die off. Hopefully we will see a new day for America and the world. A day when we can all wake up in the morning and browse our favorite site, listen to our favorite radio station or read our favorite newspaper without having to read another CIA script pro war propaganda story. I believe this is possible some day. Let's imagine that day can happen and perhaps before we know it, it will.